Nalanda University was an ancient centre of learning in India, and among the first great universities in recorded history, predating such institutions of higher learning like Al-Azhar in Egypt (10th century AD), the University of Bologna in Italy (11th century AD), and Oxford University in England (12th century AD). It was also the first ever residential university in the world, holding capacity for thousands of students to stay on campus in dorms. One of the interesting aspects of Nalanda University was its intake of ‘international students’ from as far away as Korea, Japan, China, Tibet, as well as Southeast, Central, and Western Asian regions. Nalanda University’s appeal to scholars from these regions was due to the fact that it was one of the most important seats of learning in the Buddhist world. 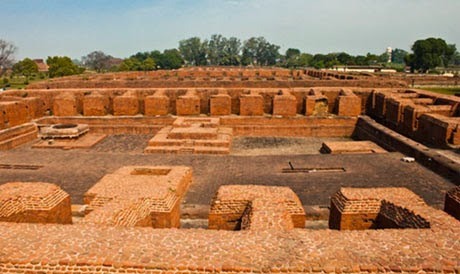 But despite its focus on the study of Buddhism, students at Nalanda University were allowed to pursue other areas of knowledge, such as the fine arts, medicine, astronomy, mathematics, politics, and even the art of war. As a result, numerous illustrious thinkers were associated with the university. The real blow to Nalanda came with the arrival ov Muslim invaders in 1197 led by Mohammad Bakhtiyar Khilji, a general of Qutubuddin Aibak, who were intolerant of the other religions and cultures. Much of the university was demolished, its priceless library was burnt down and many of its scholars, including Buddhist monks, were mercilessly slaughtered, in what was one of the greatest acts of cultural vandalism in India. For a long time now Amartya Sen has aired views upon everything except perhaps economics. He is a ‘historian’, ‘political scientist’, ‘philosopher’, ‘sociologist’, ‘institution builder’, ‘self-appointed non-resident Chancellor, Nalanda University’. He has been adored by Indians almost as a sage. The Nobel Laureate in Economics (1998) never had any practical solution for India’s economy in testing times. Neither his economist friend Manmohan Singh nor his student Kaushik Basu, former Chief Economic Adviser, could leave it in better shape. The Govt spent Rs. 2.11 Crore on meetings held by a “Mentor Group” constituted under the chairmanship of Prof Amartya Sen in Singapore, Tokyo, New York & Delhi to conceptualize establishment of the university. The group formed in 2007 was supposed to file a final report in nine months but Amartya Sen never bothered to submit even in three years the detailed project report. The great economist could not even prepare a financial estimate for the project or bring any funds from abroad. Yet he was made Chairman of the Governing Board of Nalanda University. And finally the Board, chaired by him, chose him as the Chancellor in Beijing in 2011. What could be a better way to cling on to power; enjoy flying trips and luxury hospitality; and get repeated opportunities to preach to lesser mortals of India? A courteous media never put uncomfortable questions to him when scandalous appointments and arbitrary dealings became apparent in Nalanda University. APJ Abdul Kalam, former President of India, who originally envisioned the project, resigned in disgust but never shared with media why exactly he left the Nalanda University project. The project was his brainchild. 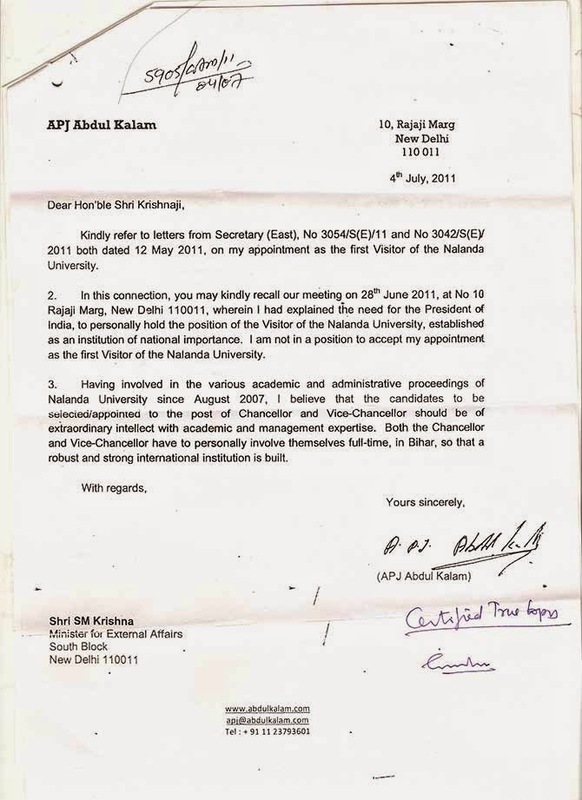 It was obvious in Kalam’s own words- his letter to the External Affairs Minister on July 4, 2011. Kalam’s letter to Mr. S. M. Krishna reveals why he was not in a position to become the first Visitor of the Nalanda University The MEA suppressed the letter until it was retrieved through an RTI application. Kalam felt frustrated with the people at helm of affairs. His resignation is evidently a rebuff to Prof. Amartya Sen and his protégé Dr. Gopa Sabharwal, smuggled in as the Vice Chancellor-Designate without his knowledge. Being chairman, Governing Board, Prof. Sen’s position is equivalent to Chancellor (the University officially has none as yet). Neither Prof. Sen nor Dr. Sabharwal could inspire the confidence of Dr. Kalam. With a mind besotted with Oxford, Cambridge and Harvard he views Nalanda University through that prism. The glory of ancient Nalanda University was not really that students from all over East Asia came to study there. Its glory was that committed Pandits like Arya Dev, Silabhadra, Dharmapala, Santarakshita and Chandragomin spent their lives for the sake of that institution. But to Prof. Sen ‘Nalanda University’ is pure exotica. Had Amartya declared, having achieved and obtained everything an academician can dream of, building Nalanda University was his life’s mission and he would settle down in Bihar for that, one could have appreciated it. But Amartya views ‘Nalanda University’ as an opportunity for flying trips (at the cost of Indian taxpayers) and flowery speeches. The fault lies actually with Indian establishment. Entrusting the task reviving Nalanda University to Amartya Sen & Co is testimony of India’s obsequiousness. This obsequiousness is what Dr. Kalam has repeatedly warned Indians against. The controversy, however, erupted with the appointment of a ‘Vice Chancellor, designate’. In reply to a question on August 25, MEA said no vice-chancellor has been appointed in Nalanda University. However, according to an RTI reply, vice chancellor Gopa Sabharwal and seven of her associates are drawing salaries since October 2010. Vice-chancellor draws salary of Rs 5,06,513 per month. As per the Act, the headquarters should be at Nalanda, Bihar, but within two months of Gazette notification on September 22 last year, were shifted to RK Puram in New Delhi. Under Government of India Allocation of Business Rules, 1961, MEA is not authorized to manage or own a university unless part of an inter-governmental agreement. 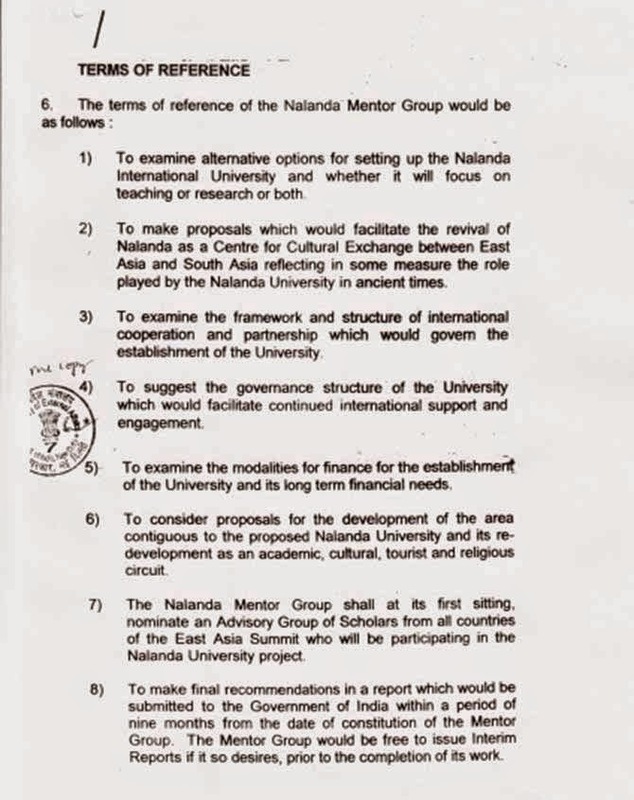 No inter-governmental agreement exists for Nalanda University, unlike the South Asian University. The incumbent Gopa Sabharwal, appointed through an order issued by a secretary in MEA on the recommendation of the mentor group, is just a reader in the department of sociology in the Lady Sri Ram College and has nothing to do with the Buddhist studies for which the university is to be set up. She did not meet the mandatory qualification set by the University Grants Commission (UGC) for the vice-chancellors of the central and state universities to be distinguished academicians with a minimum ten years of experience as a professor in a university system. Ignoring the government’s recruitment rules that require public notice, Dr Sabharwal picked up her friend Dr Anjana Sharma, an associate professor in Delhi University, as the Officer-on-Special Duty (OSD) on deputation, with gross monthly salary of Rs 3.30 lakhs, which is more than the salary of a Vice-Chancellor in the rest of the country. 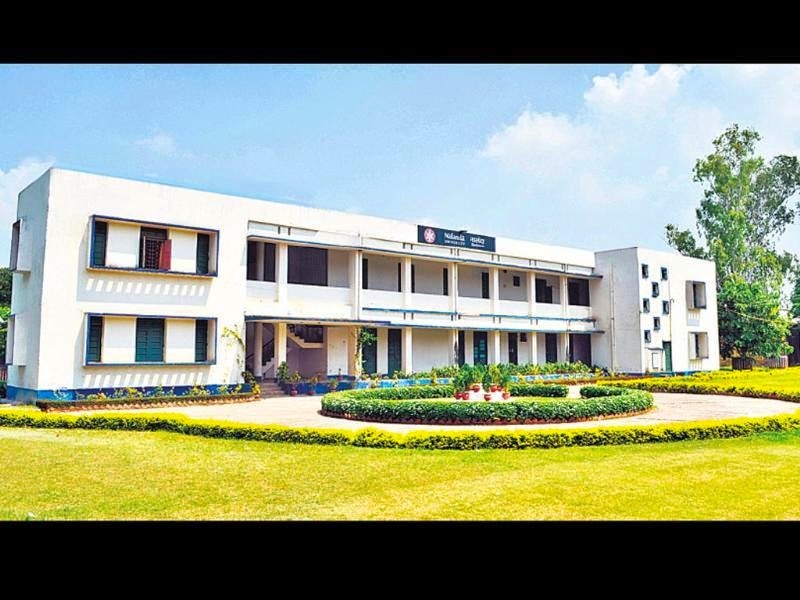 The Standing Committee of the ministry says in its report just tabled in Parliament that the Nalanda project was estimated in 2007 to cost Rs 1,005 crore but this may have to be revised, and that the same mentor group has now become the interim governing board of the university. In its very first meeting in February, this board nominated adviser committee to help out and two persons representing India in it are Ms Upinder Singh, daughter of Prime Minister Manmohan Singh, and her colleague Ms Nayanjot Lahiri, who are not experts on any aspect of the Nalanda tradition or history. 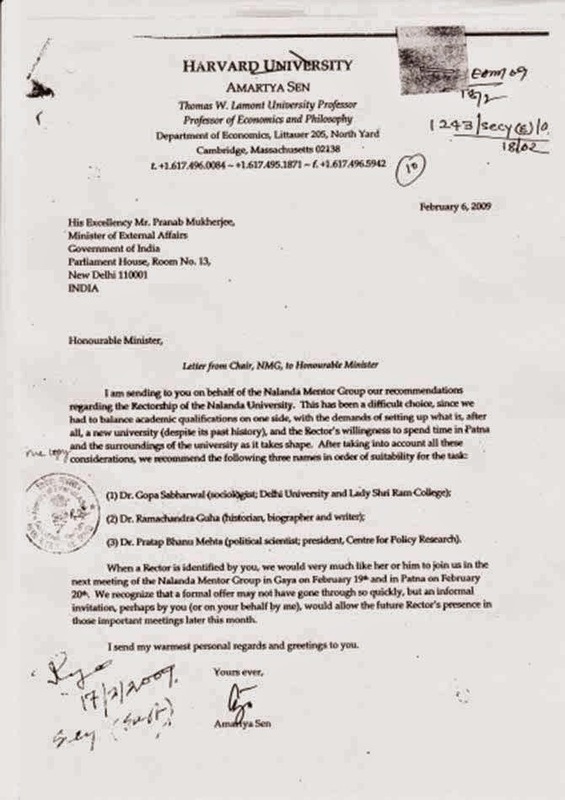 But as Amartya Sen’s letter to Pranab Mukherjee, i.e., February 2009 reveals he recommended three names for the post of Rector. They were in order of preference a) Dr. Gopa Sabharwal b) Dr. Ramchandra Guha and c) Dr. Pratap Bahanu Mehta. How the names of the three candidates were shortlisted; how was the selection process conducted; and who were there in the search committee is a closely guarded secret. As far as one understands (a) the plump post was never advertised/publicised (b) no search committee was constituted c) there was no interview or selection process and d) Ramachandra Guha and Pratap Bhanu Mehta were never contacted for this top job. Amartya Sen never submitted any supporting papers related to the selection. Amartya Sen’s criticism of Narendra Modi is also a product of political sponsorship. It has to be understood in the perspective of the ‘politics of obligation’ practised within the Amartya Sen-JD(U)-UPA triangle. The cornerstone of this relationship is vested in the Nalanda University project. It is this fraudulent project that binds Amartya Sen, UPA and Nitish Kumar. It extends to supporting the policies of Manmohan Singh’s Government in New Delhi and Nitish Kumar’s Government in Bihar. In fact Manmohan Singh and Nitish Kumar are both using Amartya Sen to validate their policies (including follies). Many primary school buildings are better than this building worth several hundred crores. Amartya Sen is threatening to resign after the finance ministry raised pointed queries on the financial management of the varsity, said an Indian Express report. The varsity has been granted a massive Rs 2,727 crore financial support package over a period of 12 years. The finance ministry’s Department of Expenditure has asked the Ministry of External Affairs, the nodal ministry for the project, the reasons why government rules should not apply to the project, said the Indian Express report. Nalanda University has become a private estate with public money in the name of autonomy. Amartya has no fig leaves to the hide himself. Only the media is not asking him the right questions. let us ask the last question loudly? why is media not asking real questions? If this is a scam of the magnitude the author insists upon why doesn’t the GOI initiate an inquiry into it? After all he is an Indian passport holder and can be tried in Indian courts. Dave Sherman. Prof Sen cannot escape responsibility here. This Govt has too much already on its platter to indulge into ridiculing an otherwise excellent academician. He has been a failed administrator, that is proven. Only if he continues to play victim in the hands of media, it is the duty of the Govt, to let his term continue, until proper investigation is completed, and hold him responsible. Let us see. Excellent post, thanks for the detailed blog and the goodness to question. & some one hear asked about why not the media ask this question – well, we know what hogs eyeballs and TRP – not questions to answer for sure. Great eye opening post which reveals the truth about Amartya Sen and his cronies. incompetent fellow has not been able to establish anything on the ground. And his cronies are busy earning half a crore a year salary and living in air conditioned comfort in New Delhi. what a great fraud on the people of india. After Shubhas Chandra Bose Bengal sadly never had any administrator of any repute that warranted international attention. Then came Amartya Sen, starting with the premise India was poor and lowly but for likes of him. He was naturally selected in view of his background, though in another completely different field of study. That his admin skills are poor is now known. How long he survives due to cronyism remains to be seen. He got a nobel and that is not surprise even Barak Obama has got it without doing any thing every thing can be managed including this Nobel prize good god Mohandas Karamchand Gandhi was denied. Put Mr.Sen and Ms.Sabharwal under scanner and let them justify and account for the state of affairs till its logical conclusion. Punish the guilty .howsoever big or renowned he/she may be . What happens to the re-created Nalanda University or it turns out to be a fiasco with democracy of the kind we have today. Would be lovely if you define ‘democracy’ once. any legal case possible against Sen ? for fraud ? Yes legal case is already there. Mr. Subrabaniam Swami has already said there should be a CBI case against Amartya Sen under the Prevention of Corruption Act. Gopa Sabharwal has already committed ” Fraud ” under the Indian Penal Code by appointing her girlfriend Anjana Sharma as OSD Nalanda. Embezzlement of Public money is a crime under the Indian Penal Code – and it is only time before these women and Amartya Sen get caught. Oh my India … How many of these kind people shall plunder your wealth, hurt you, harm you, destroy you. When will this situation change for you. God, please save & restore my India. Amartya Sen received a politically oriented Nobel Prize. Nalanda University project surely was mishandled. It has noting to do with BJP’s nihilist government. It is the politics of elitism hounding behind the project. Amartya Send gas been given lifetime free teavel on Air India despite holding highly paid overseas job, a rich Nobel prize, and minimal contribution to India. Shouldn’t our mentality for eulogising NRUs who make it being be questioned as it reflects our poor self esteem. It is commonplace for many such luminaries to make their careerin running diwn their birth xountry, and yet we eun after them to reward them and recognuse them. Let the countries where they reside and xontribute do that instead. His travel privileges must be taken away as he has neither earned it, nor his conduxt jystifues it. Dr Amartya Sen does not have any vision except sharing his egalitarian thoughts in NDTV. Smriti Irani was hounded only because she asked questions to the so called elites in various Institutions and tried to enforce discipline and accountability as public money was being spent. Autonomy in academic matters does not entitle anyone to indulge in corruption, nepotism and Amartya could not find anyone from India for any of the Institutions he mentored. When u restrict urself in selecting faculty from persons from your state only, ignore merit or assume that merit does not exist anywhere else except those with leftists views, condemn India and its ancient wisdom, u will only create a bureaucratic fools paradaise and not a centre of higher learning. Nalanda was an historically renowned institution of ancient India and the neo liberals and leftists are british colonial mercenaries who were propagating and monopolising the educational arena in the country. Amartya Sen was unfit to head such an institution in any capacity with his constricted ideas and world view which knows only to be a slave to earn livelihood.